This is a set of four AKA Racing EVO 1/8th Off Road Wheels. From the brains of Mark Pavidis and Gil Losi Jr. comes a complete redesign of the AKA buggy wheel. 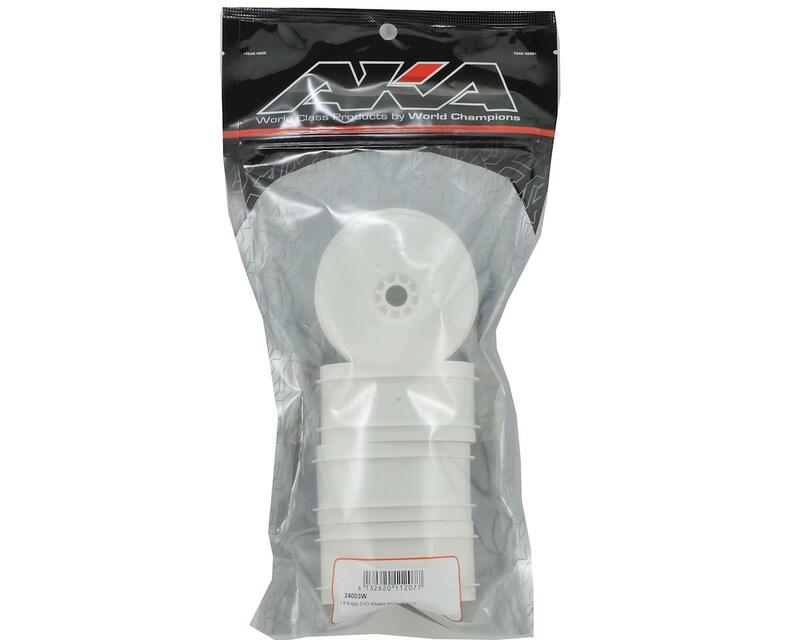 Now that AKA's closed cell foams have become a part of everyone's product line it became apparent to us that all the current wheels are too soft compared to the now stiffer inserts and the ever increasing G forces of modern 1/8 buggy chassis. The goal was to achieve a stiffer wheel without sacrificing weight or durability, once again raising the bar and changing what you expect from the performance of your 1/8 buggy wheels. Mark and Gil were able to reach this goal by first changing the face of the wheel from convex to concave. This design change helps the EVO wheel deal with the ever increasing G-loads of a modern 1/8 buggy without distortion of the face of the wheel. Next they were able to kill two birds with one stone by developing an optional internal dish which serves two purposes. The first and most important purpose is to further stiffen the wheel and especially help the inner most bead of the wheel hold it's shape. The second purpose of this dish is to block dirt from being trapped within the inner ribbing of the wheel and throwing the wheel out of balance. 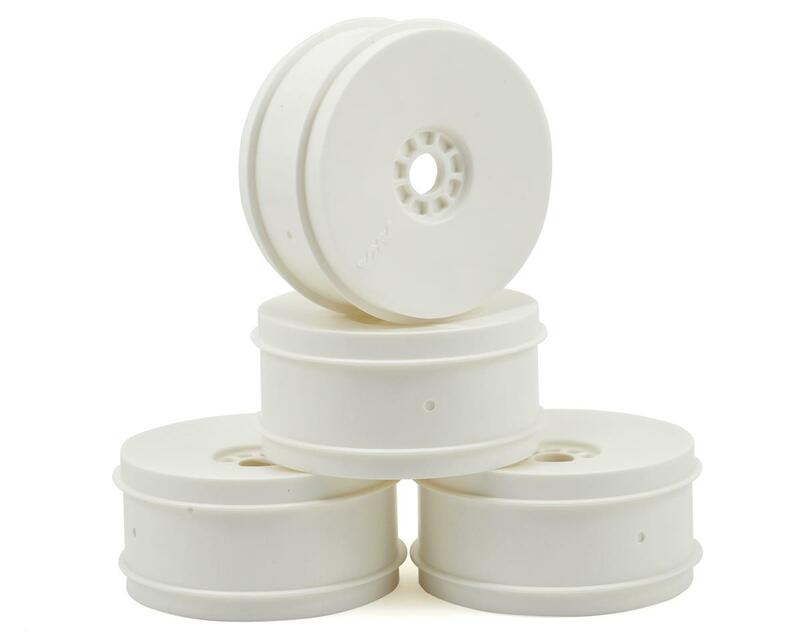 These design innovations allowed the wheel to be stiffer without going to stiffer and therefore more brittle plastic or increasing wall thickness which gives up clearance and adds weight at the outer edge of the wheel. The advantage of the stiffer EVO wheel shows up immediately on rough tracks, high bite tracks, tracks with large jumps and tracks with high speed sections. The EVO wheel is still made from the super durable AKA nylon that current AKA customers are used to. The inner wheel stiffeners are available separately in sets of four in both white and yellow and are removable and transferable from set to set. The EVO wheel can be used without the inner stiffener, but we know once you use the stiffeners, you won't want to go back. NOTE: AKA EVO wheels do NOT include the internal stiffening dish (AKA34003). These must be purchased separately. Great rims. Realize these are the Evo rims, which allow you to buy separately the stiffeners which screw into the rim to make it stiffer if needed. On most tracks I just run these regular rims as they are light, durable, balanced, and flex a bit for bumpy tracks. If I need a more stiffer wheel/rim, then I just screw in the stiffeners (which are sold extra). Basically two options from one rim instead of have to buy soft rims and a separate set of hard rims. If interested the Associated rims are also soft but with no option to get stiffeners. If you want stiff rims, then get the Pro-Line v2 rims. Personally I like the option of these AKA Evo rims as you get both options from one rim.